Apparently, the Gambling Gods appreciate Chael Sonnen’s entertaining trash talking because they have sweetened his pot. The powers that be have moved Sonnen to an even larger underdog (+325), teasing gambleholics worldwide to lay some money on the talkative challenger at UFC 117. 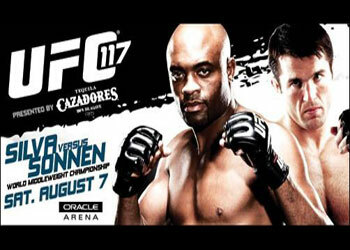 The pay-per-view broadcast will be jumping off inside Oracle Arena in Oakland, California on August 7th. Although middleweight champ Anderson Silva has been fairly quiet leading up to his highly anticipated title defense, it doesn’t mean he hasn’t heard or will forget the barrage of disses Sonnen has fired his way. Just two weeks ago, the Team Quest trained fighter was at +275 while Silva was a 4.5-to-1 favorite. Although “The Spider’s” line stayed steady, it looks like the money is still moving his way as Sonnen becomes a much bigger ‘dog. Ngo-stradamus stated before that he “REALLY” liked Thiago Alves at -130. Well, don’t hit up your illegal internet sports books just yet because the Brazilian dropped to -125. Let’s keep monitoring this line as game time approaches.